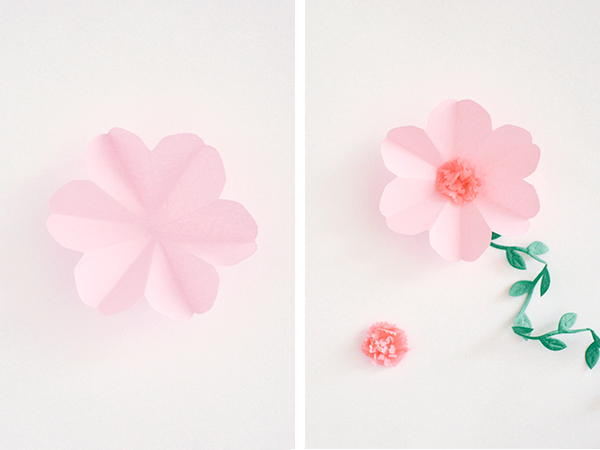 Continuing with the flower theme of yesterday's 12 Months of Martha project, I wanted to share a method I stumbled across for making quick and easy paper flowers. I love how you can make a bunch all at once! I happened to see an all-white version of these while passing a Fossil storefront -- they looked whimsy and dimensional at first glance, but up close you could tell they were made using basic origami folds. I knew I had to try them out, so I snapped a photo and Q helped me come up with a similar version. 1. 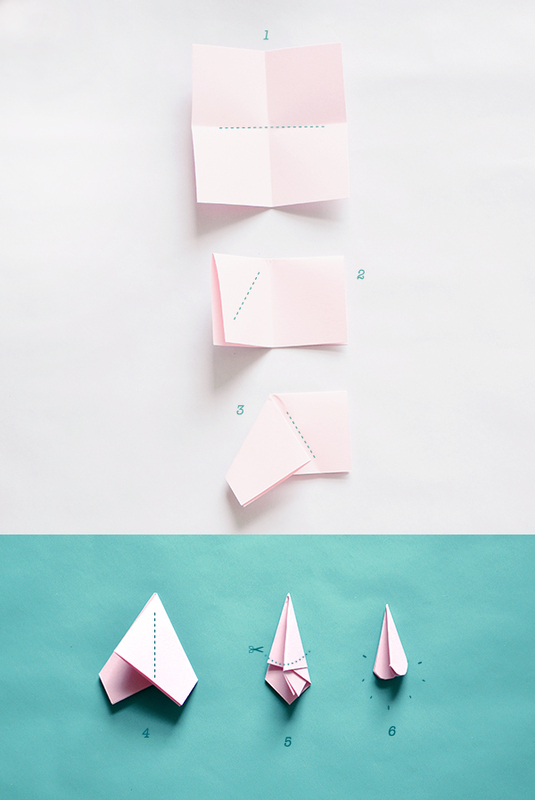 Fold & unfold a square piece of paper in half both directions to make light crease lines. Refold in half just from top to bottom. 2. Fold left side down to right, forming an approximate 60 degree angle line from the top center crease. 3. Next, fold right side down over left at another 60 degree angle, adjusting so both folds are centered off that middle crease line. 4. Now the two overlapping folds will form a point. Fold in half side to side. 5. 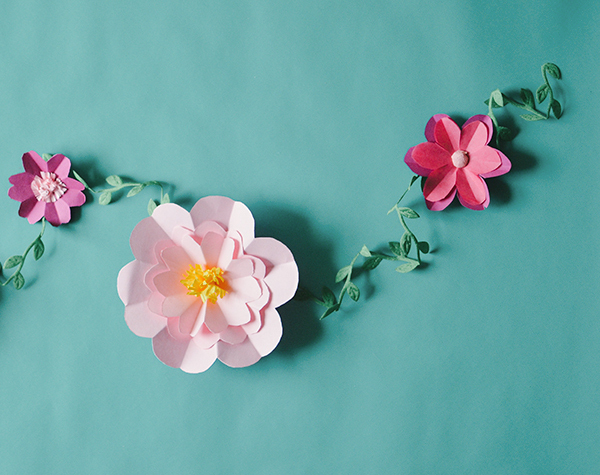 Trim uneven layers off bottom edges in a rounded petal shape (or any shape you'd like). 6. Unfold your new flower! 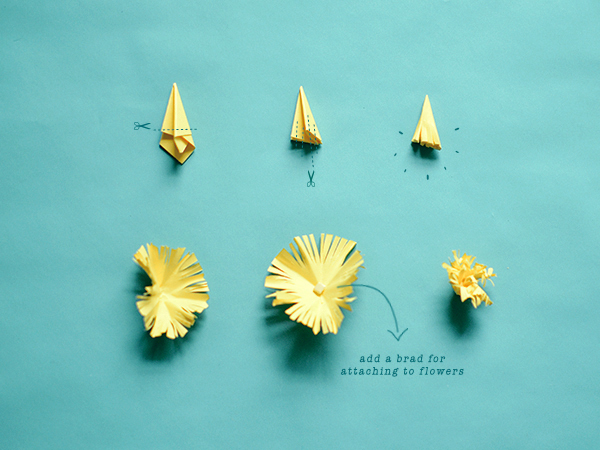 Refold, trim, crisp your crease lines (to give each petal dimension), etc. as necessary to get the exact shape you want, and stack layers together for an even fuller look. To add more detail, I used the pink pom stickers as a quick 'stamen', but you can also make them from a tiny piece of paper (see above in yellow). I used the same steps as the flowers, but fringed the edges, unfolded, and added a brad to the center before scrunching it back together. Overall, the flowers take a little bit of trial & error at first, but once you get going they go fast. And it's fun to come up with endless variations -- hope you give them a try! 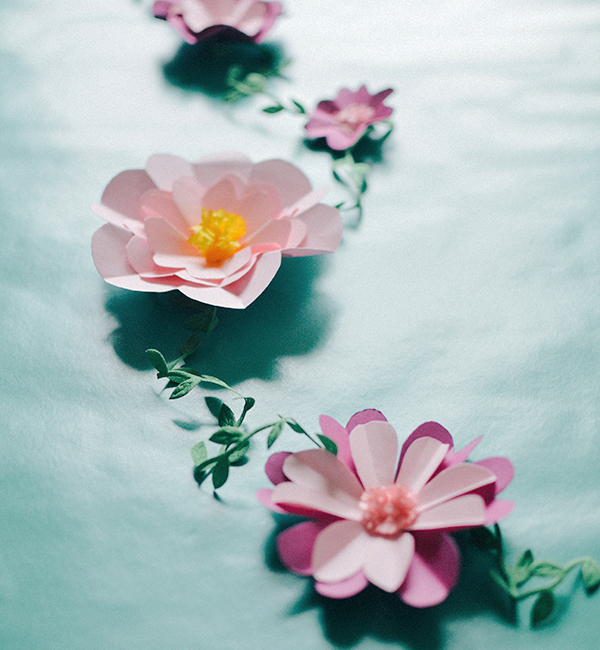 I don't think I'll ever get tired of paper flowers :-) These are so pretty, and I love the leaf ribbon!